Aries (March 21-April 19): Games lover: Boyfriend who likes playing games is good for you because he has rich imagination and is an adventurer. Taurus (April 20-May 20): The nerd boyfriend: These guys are chill and like to stay in, which is not bad. Also, they are thankful to have a girlfriend, which makes you feel good, and glasses look good on them. Gemini (May 21-June 20): Mean but nice: These people like boyfriends like them – sometimes arrogant but sweet and gentle from the inside. You like guys who will never make you feel bored around them. Cancer (June 21-July 22): The sweetest boyfriend: You need a sensitive and caring boyfriend who will never hurt your feelings. This type of boyfriend will never play with your emotions and truly means the I love you words. Leo (July 23-August 22): Boyfriend who supports you: Because you are in the spotlight, you need a boyfriend who won’t try to change that but instead let you shine. 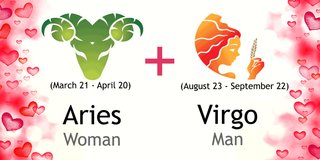 Virgo (August 23-September 22): Feminine boyfriend: Because you can be analytical, critical and uptight, you need a boyfriend who is more sexually fluid to loosen you up and make you try something new. The boyfriend who is equally comfortable with his feminine side is perfect for you. Libra (September 23-October 22): The fun one: Because you have a great charm and are social, the perfect boyfriend for you is the fun one in order to keep up with you. You will be considered the fun couple. Scorpio (October 23-November 21): The hot boyfriend: Passionate and sexual people as Scorpios need someone as sexually adventurous as they are. Sagittarius (November 22-December 21): Boyfriend who is flexible: You are an adventurous person who loves visiting new places and meeting new people. So, you desire a boyfriend who is spontaneous and adventurous as you are. Capricorn (December 22-January 19): The one into music: Because you are a person who has planned whole life, which can actually get boring, you need someone artistic to show you another perspective of life. Aquarius (January 20-February 18): Emo boyfriend: You are a clever person who does not share emotions too openly. Your boyfriend should be someone who is totally the opposite in order to be balanced. Pisces (February 19-March 20): Boyfriend who is an artist: You are an art lover and an artist yourself. You don’t mind stay in the shadows and let your boyfriend’s art overwhelm the world.